LeBron James is following in the footsteps of Michael Jordan in more ways than one as he prepares to bring 'Space Jam' back to the big screen. 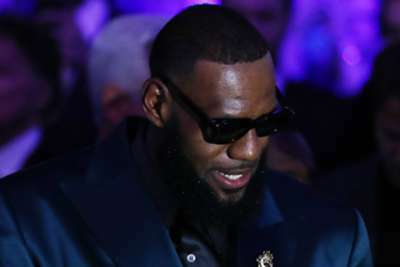 Los Angeles Lakers and NBA superstar James – regarded as one of the greatest ever players along with Jordan – sent the basketball world into meltdown on Wednesday, uploading a picture to Instagram which confirmed he is set to star in a Space Jam sequel. Hall of Famer and Chicago Bulls great Jordan, who won six NBA titles, and six Finals MVP awards, starred in the 1996 original. Now James is preparing to bring the iconic basketball movie back to life. SpringHill Entertainment – James' production company – teased a preview, announcing the team that will feature in a photo of a locker room, including Looney Tunes cartoon character 'Bugs Bunny', LeBron as a small forward, director Terence Nance and producer Ryan Coogler. "The Space Jam collaboration is so much more than just me and the Looney Tunes getting together and doing this movie," said James, who is gearing up for his first season with the Lakers. "It's so much bigger. I'd just love for kids to understand how empowered they can feel and how empowered they can be if they don't just give up on their dreams. And I think Ryan did that for a lot of people." James is no stranger to Hollywood, having featured in Amy Schumer's 2015 romantic comedy 'Trainwreck'. The former Cleveland Cavaliers superstar also has a new HBO series, 'The Shop' – an unscripted barbershop-set show.